The coccyx cushions are best at supporting the base of the spine and keeping the coccydynia (tailbone pain) away. A pain is never welcome – especially when it’s the kind that barely lets you sit on your chair. Tailbone pain may happen for various reasons such as long sitting hours, childbirth, pressure, trauma, infections, or tumors. The reasons are many; however, the result is that the muscles, around the joints and ligaments at the base of the spine, get inflamed and eventually start aching. Physicians may prescribe pain management and anti-inflammatory treatment for this condition. However, when it comes to long-term management, you must invest in a pillow or cushions designed for people with tailbone pain. Coccyx seat cushions let you sit comfortably on various seat types, without adding pressure to your base of the spine. And to pick a good one, some advice will always come in handy. Pain Relief: This is perhaps one of the most obvious reasons why you need such a pillow. If you are the type of person whose job keeps them sitting on a chair for long periods of time, then a coccyx pillow will offer your lower body the support that it needs. Posture Improvement: If you have to sit in the same position for a long time, it’s obvious that you are going to start slouching at some point – and you won’t even notice that you are doing it. A tailbone pillow, however, will keep your pelvis slightly elevated so that your spine remains upright – and therefore, you don’t slouch. Gentle Support: A coccyx pillow is usually made from special foam that will offer you gentle support and allow you to sit in a comfortable position. It will push the pelvis slightly forward and, therefore, it will fix your tailbone problem. Cut-out Feature: Noticed how the pillow has a unique design, different from regular pillows? That is not only there because the manufacturers thought it looked beautiful; it serves a crucial purpose. It will offer you the space that you need to elevate your pelvis so that it does not stay in contact with the seat. Once more, this will help take off the pressure. Different Sizes and Shapes: This isn’t beneficial only because we want to be “classy” with crazy designs; tailbone pain differs from one person to another, so a shape that works well for your friend may not work just as well for you. It is why you need to test the pillows out, to see which one supports your pressure points the most. Highly Portable: The best thing about tailbone cushions is also that they are portable. No matter if you are using it at home or you need to take it to your car or at work, such a pillow might be a portable lifesaver. The first advice should be buying the best coccyx cushion and using it whenever you have to sit. However, there are a couple of other tips that can bring significant relief to your sacrum area, if followed. This one will help you a big way. If you sit on a hydraulic chair, make sure you set it to only so high that your feet touch the ground firmly and are not in the air. 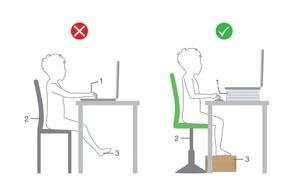 If you can't adjust the height of the chair, getting a small box to put your feet on will also do the trick. Grounding is an excellent technique to distribute your body weight evenly and provide extra support to your pelvic area. This trick alone will reduce your coccyx pain significantly. This one is self-explanatory. Make sure you take a relaxing walk down the corridor every 25-30 minutes. You can set a reminder for this on your cell phone. It will give your pelvic muscles time to get some relief and the blood to circulate thoroughly. Moreover, you can be creative and try a standing desk whenever possible instead of a sitting desk. Some other suggestions include conducting a meeting while walking, taking some work home and competing it while laying on your back, etc. You got the idea. Do what you have to do but make sure you are not sitting for too long in a single stretch. If you’re new to this kind of problem, you may not know exactly how to pick the best tailbone pillow to offer your spine the support that it needs. There are many styles of tailbone-relief pillows out there, and each of them offers a different type of support according to your body shape, weight, or pressure points. The most popular ones are circular or donut-shaped pillows. These styles have a hole in the center that takes off the pressure from the tailbone. Wedge cushions are also fairly popular since they are so versatile, while inflatable ones are an enough good option for those who are always on-the-go. You have to choose your style depending on how you plan on using them and where. Depending on how much money you are willing to invest, tailbone pillows may have different fillings. You can get one with the regular cotton filling, or you can get one that uses deluxe memory foam. You may want to go for one that uses higher-density memory foam since those will work best in supporting your spine – especially if you have some extra pounds to take pride in. While some cotton-filled pillows may be a good budget option, not all of them have the ability to offer you the comfort that you need; not unless they are from a high-quality brand. Some tailbone pillows are more comfortable than others, and that is mostly due to the thickness. Keep in mind that thicker doesn’t always mean better; too much cushioning may make it awkward for you to sit while too little cushioning can lead to further pain. It’s best that you find a balance that is suitable for you. Tailbone pain relief pillows can be found in several shapes – the most common of them being the “V” and the “U.” It’s crucial to pick a cushion shape that works for you since the wrong one will not be able to take the pressure off the spine. Thus, it may deteriorate your coccydynia. At last, Nobody has the same type of tailbone pain, and it might take you a few tries until you get a pillow that seems like heaven on earth. All you can do is narrow it down based on these criteria, keep your comfort in mind and start experimenting until you get to the one that seems to have been sent by God. This seat pillow is a great option if you have a recurring problem of sciatica and back pain. Its ergonomic design will reduce the pressure put on the tailbone while its U-shape will promote a healthier and straight posture. This pillow is made from high-density memory foam to offer you as much support as you need while still being very comfortable. Its non-slip rubber bottom will keep the pillow from sliding out of place, and the zippered cover can be easily taken off for cleaning. Women who have pregnancy related back pain may also benefit from using this pillow since its thickness and design will keep your lower spine straight and away from the hard seat of the chair. The sides of the pillow will prevent you from falling off of it. The specially contoured design not only supports your back but your legs as well. The anti-slip bottom will prevent the pillow from sliding from the chair, regardless of the fabric it’s been put on. It only comes in gray color. It may be uncomfortable for people with some extra pounds. While this product was made out of high-quality memory foam, it’s a good choice for those who are doing their shopping on a budget. This seat cushion promises a healthy posture, back pain, and pressure relief, but also an improved blood flow to the lower back and your extremities. The firmness of the pillow was made to change according to the temperature. The colder the room, the firmer it will be. To get the best results, you may want to keep the pillow at room temperature. The U-shape design of the coccyx pillow helps take the pressure off the painful points so that you can sit for extended periods without feeling any discomfort. It’s also a great option if you previously suffered a spinal injury. Durable construction that will last a long time. Memory foam fits you perfectly, providing great comfort. Might not be long enough for tall people. It might get too hard to sit on if the room temperature is low. Coccyx Cushion Pillow is made up of 100% premium memory foam, which features orthopedic benefits. It provides remarkable comfort and support to the tailbone area by reducing the pressure on the lower spine that promotes better sitting posture. It comes with a guarantee for never go flat. They are highly versatile and portable and are built with a non-slip bottom to prevent it from slipping while sitting on any surface. It also helps you to recover from certain chronic pains like tailbone pain, lower back pain, pregnancy back pain, sciatica, hip pain, spinal issues and also herniated discs. Stays put as it has a non-slip base. Velour cover easy to remove and wash.
Never flattens and is versatile and portable. Not fit for heavy weighted people. It tends to tilt slightly backward. A lot of people love the Aylio pillow due to its soft, velour-like cover that makes you feel as if you are stroking the fur of a kitten. Moreover, this cushion cover can be easily removed and washed whenever you feel the need to. The U-shaped form of this pillow is great when it comes to taking the pressure off your tailbone as you are sitting. Plus, it has an ergonomic design that will keep your body aligned, without causing you to tilt or slide from your seat. The grooves of the pillow will help balance your weight and keep your hips stay aligned so that you can sit in a correct position. If you have problems with spinal stenosis or lower back pain, this pillow will give you some comfort. The foam is thick enough to last for a longer time without flattening. The zipper enables the easy removal of the cover. The grooves will make you assume a correct position without even noticing. It may pinch your legs on the front when it’s new. If placed on an already-contoured seat, it will put a lot of pressure on your hips. You must really check this tailbone pillow. It differs from the other pillows because the memory foam has been infused with gel. This addition will allow the foam to mold itself on your coccyx better and provide you superior support. This way, the pressure will be taken off, and it will be much easier for you to take on a good posture. The gel is also perfect for seasonal comfort since it manages to level the temperature. As a result, it will keep you cool during summer but warm during winter. You can also remove the cover each time you believe it needs washing. The removable covers make the maintenance process simple. The gel adds comfort to the pillow, allowing you to keep cool/warm in every season. The cover only comes in gray color. Ultimately, if you are suffering from tailbone pain there are various coccyx seat cushions to choose from. They have different shapes, filling, firmness, and other features. The more severe your symptoms are, the more you will have to look for a coccyx cushion that will keep the pressure off your tailbone and make you assume a correct posture. If you’re tired of your tailbone always hurting, you may want to give the products above a shot and see which one fits your needs the most.